Sally Sloane sings her version of ‘The Black Velvet Band’. Recorded by John Meredith. Sally Sloane sings ‘The Wild Boy’, a song about the prodigal son returning – from transportation. Recorded by Warren Fahey, Lithgow, 1987. Bob Hart sings ‘Australia’ a transportation ballad. Recorded by Rod and Danny Stradling in 1969. Sally Sloane sings a love ballad ‘Green Bushes’. This version recorded by Warren Fahey, Lithgow, 1987. In the early 19th century sellers of broadside ballads were a common sight in the streets of Great Britain and Ireland. 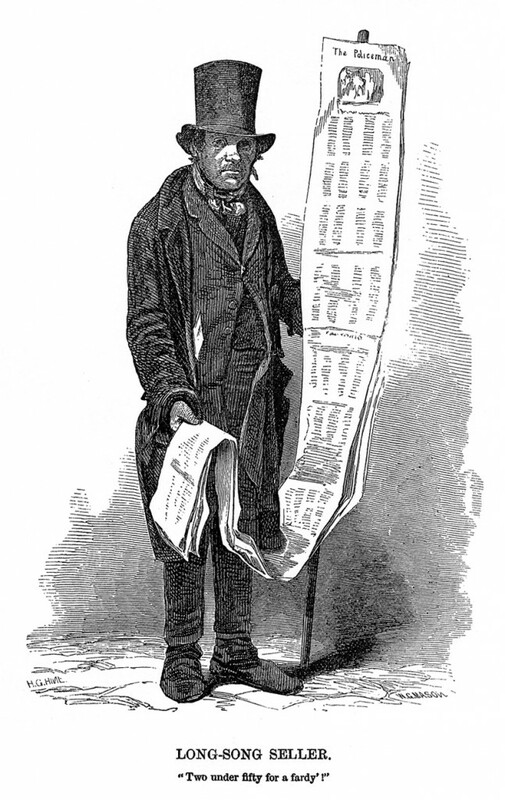 A broadside, or broadsheet, was an uncut, unfolded sheet of paper. 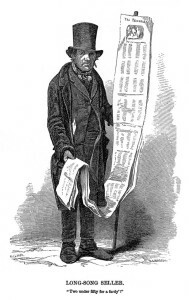 A sheet would be printed on one side – which suited it to pasting on a wall – with a proclamation, an advertise- ment, or a song or two and appropriate woodcut illustra- tions. Broadside printers employed songwriters who would attend trials and early music halls, take notes and quickly write verses, often to fit a popular tune, which the broadside named. Broadside-sellers would shout their “call” and the best parts of the ballad. Often they would sing “come all ye” songs. As book printing became cheaper many popular broadside ballads were gathered into chapbooks. The final verses of many ballads offered stern warnings against crime. Ballads such as The dreadful murder of Maria Marten and the red barn door were sung all over Great Britain and taken to Canada, the USA and Australia. In British and Irish libraries in 1985 the folklore collector Ron Edwards saw counted 160 broadsides with Australian content, notably Van Diemen’s Land and Henry’s downfall, both in several versions. It is likely that none had been printed in Australia, but some ballads had probably been composed in the colonies and taken back to Great Britain and Ireland by former convicts and others. Broadside ballads were published in Australia, however, in the second half of the 19th century, when their function had already been usurped by chapbooks, especially cheap, popular pocket songsters, such as those of Charles Thatcher. The last known broadside publisher was P.F. Collins – Percy the Poet – who sold ballads at the Sydney Cricket Ground in the 1920s and 1930s, on subjects ranging from mining disasters to sport. Present-day singer-songwriters could be said to continue this tradition. Hugh Anderson’s ‘Farewell to Judges and Juries’ (Red Rooster Press, Melbourne, 2000). Folklorist Ron Edwards also issued two volumes of reprinted broadsides as ‘The Transport’s Lament’ and ‘The Convict Maid’. The following was one of the most popular. Ballads about poaching were extremely common, because poaching itself was so widespread. As the majority of people were unable to procure fresh meat honestly, they took to stealing or poaching. It was so prevalent that it was hardly an exaggeration to say that nearly every man you met was a poacher! It was generally thought that those men were justified in their actions. In 1828 the penalties for poaching became three months imprisonment for the first offence, six for a second and seven years transportation for a third. But if three or four men, one of whom carried a gun or bludgeon, were found in a wood, all were liable for transportation for fourteen years to Van Diemen’s Land. The island was first used as a penal settlement in 1804 and continued as such for another forty-nine years. Port Arthur was considered one of the most dreaded prisons although it was a ‘model prison’. We dared not to say nay. To plough Van Diemen’s Land. Which we shall see no more. You ne’er would poach again.